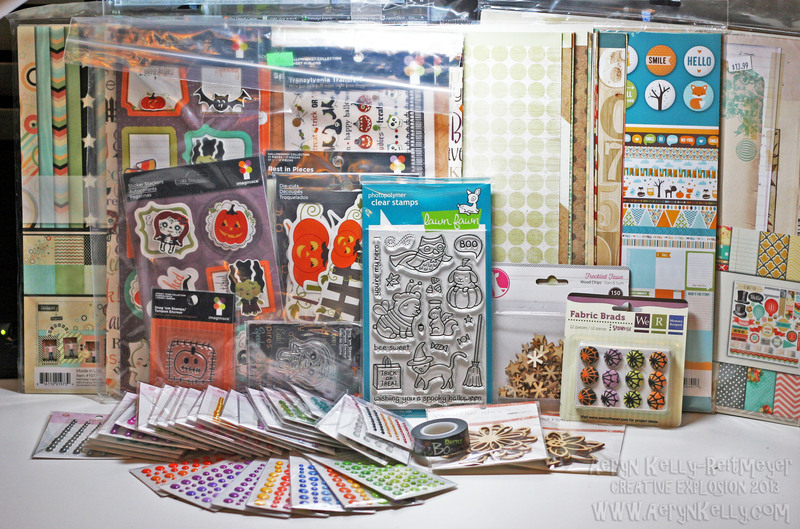 On Saturday, the 12th, I went to the Ontario, CA Scrapbook Expo! YAY! I had a great time and got to meet a new friend from my message board. She was super nice and we hung out the whole time, making two passes through the show floor. Sirius had a great time too as he was a huge hit. People cooed at him and wanted to pet him so he was in heaven. I had made a list of what I wanted, but forgot it my purse when Mike dropped me off so I was kind of flying blind. Sadly, a lot of what I wanted wasn't there. I figured the fall lines and the Halloween lines would be plentiful, but only two stores seemed to have anything new at all, and certainly not for any kind of deal. One store I went back to you could grab a ping pong ball with a discount on it, and I got 15% off from my purchase there. That was nice. Saved me $9 on the Doodlebug dots and Fancy Pants paper (that's what I bought from them). It was just sad though cos I'd been looking forward to being able to pick up some things RIGHT NOW to play with and, no, just weren't there. One thing that *was* really good was that I got to see the new Maggie Holmes paper, the Glitz paper, the Dear Lizzy Polka Dot Party paper, and a few other things in person. Turns out I don't actually want any of them! I didn't like the colours IRL and I keenly remember an order around this time of year last year that I ended up disappointed in because I wasn't happy with the colours. Expos are kind of the only place I get to see some of these things IRL so it was nice to know not to order this stuff! Well, that was my haul. I had a great time and REALLY cannot wait until March for the Anaheim Expo. I'm going to do everything I can to get there and I know a bunch of people from my message board going so I really want to meet them. Here is an itemized list of what I got. This isn't for bragging or anything; I just want to remember as my previous Expo posts left out the prices and I want to know just what I got and for what price. Queen & Co bling/pearls (25) - .50 each.